New Mexico's largest teachers' union, the Albuquerque Teachers Federation (ATF), the largest affiliate of AFT NM, constantly beats the drum for higher teacher pay. This is what any good union does for its members. Included as part of "What We Stand For", ATF writes, "Educators need compensation comparable to others with similar education and experience levels." Sounds great. Teachers work hard and deserve better pay. I agree. As the child of a lifelong educator (and ATF member) and former teacher myself (and card carrying union member), I'm on board. The Albuquerque Teachers Federation and AFT issuing a call of action AGAINST higher pay for teachers in order to score cheap political points. Are you as confused as I am? Ok good, because I'm left scratching my head, yet again, at a regressive stance from a so-called "progressive" organization. In what universe is a potential raise for teachers and an additional path to administration a bad thing? Welcome to the "upside down" that is Albuquerque education. Let's look at House Bill 177 (HB 177), the "Level Three Teacher & License Salary" bill. Put simply, HB177 provides the opportunity for our best educators to progress up the career leader without making them jump through hurdles that have no impact on student learning, like earning a Master’s degree. HB177: An earnest effort supported by a majority of NM teachers to increase their pay and provide an easier pathway to leadership. Ask any teacher with a Master's you know how much that degree helps their practice. I do all the time and, if it weren't for the pay raise, most wouldn't do it. It's a substantial financial and time investment. Both are things our teachers are in short supply of. Higher education bears the brunt of this blame, but that's an entirely different post. Nationwide, 48% of teachers in the U.S. hold a master's degree. For the most part, teachers pursue Master's for the accompanied pay raise. Who can blame them for that? Making matters worse, the research is pretty clear. There is little evidence that a Master's degree improves student learning. Or, as the researchers say, "past research depicts a complex, poorly understood relationship between teacher educational attainment and student outcomes." We also can't forget that, before New Mexico connected teacher evaluation to student learning, there was essentially no difference between different licensure levels. This makes the ATF's successful effort to kill HB177 all the more confusing. That is unless you understand two things. 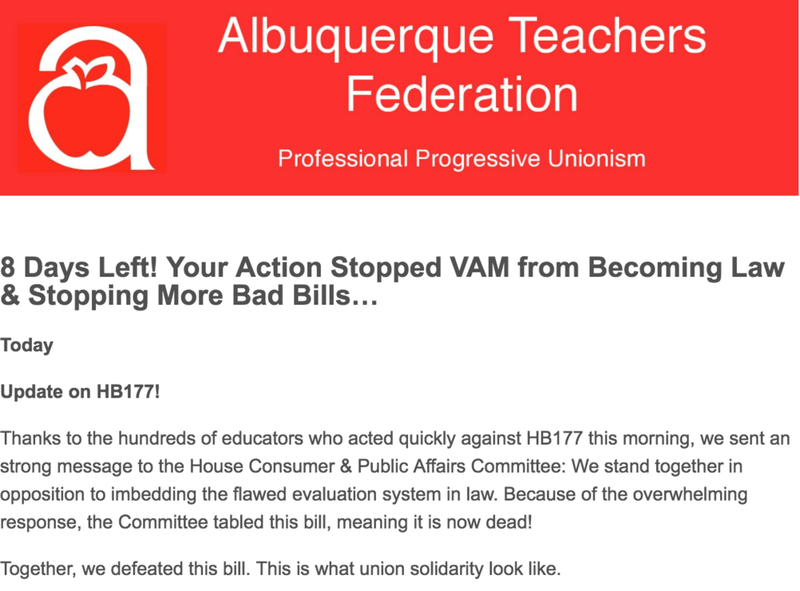 First, their undying hatred for our teacher evaluation system, NM Teach. They've held up the system in court for years. Despite strong evidence that treating all teachers the same is harmful to both educators and students. And, two, their aversion to paying teachers different salaries based on performance, an idea as common place as gravity everywhere except public education. Nearly every other profession in the world differentiates pay based on performance. Yet, we don't see people on the streets fighting to the death ala The Purge, or "pitted against one another" as the ATF eloquently puts it. This is a tired scare tactic, nothing more. The Smear Machine in Action: Dancing on the grave of higher pay for teachers while simultaneously bashing another collective of teachers they happen to disagree with. Not only is this effort supported by 74% of New Mexico teachers, it's a commonsense way to ensure we keep our best teachers in the Land of Enchantment. Creating this additional pathway to higher pay provides thousands of teachers (up to 32 percent of level two teachers) an opportunity to be fairly compensated for their hard work and impressive results. Though this effort has reached a seeming dead end this year, I hope to see it revived next January. And, if the ATF can't keep up with the wishes of its own teachers, it's time for new leadership with a fresh vision.